The durable, waterproof DECKED D-Box (tool box) maximizes drawer storage efficiency and organization, utilizing an interlocking, nested design. Made 100% in America, The DECKED D-Box takes the ergonomic advantage of the DECKED storage system to the next level. The durable, waterproof D-Box maximizes drawer storage efficiency and organization, utilizing an interlocking, nested design with three strategically placed handle locations. A 5'5" bed length systems will accommodate 2 D-Boxes per drawer and a 6'6" will accommodate 3 D-Boxes per drawer. 20.5" x 17.5" x 8"
The toolbox was designed to carry a weight of 50 lbs, and we did drop testing analysis to show it would survive a drop test from a normal carrying height or from the height of an open tailgate on a pickup. 50 lb is the max weight one should carry, but only for shorter distances while using both hands (using our grip locations) with the toolbox close to one’s chest as one would carry a heavy box. 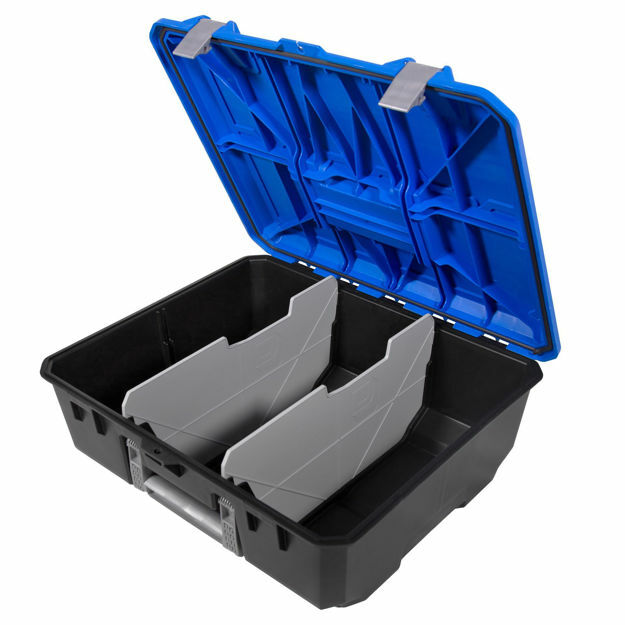 To sum things up, our toolbox is capable of carry loads greater than one should carry on a regular basis.